Joseph and Lewis Albert Rostein had this two storey commercial block erected in 1903. It featured a series of arched bays on two street fronts and large storefront windows on the main floor. By 1904 it had acquired its new name and rented premise to Thomas Plimley’s Bicycle Shop, the American consulate, and the Windsor Grocery. In 1907, the 1904 tenants were still there with the addition of Baxter and Johnson – office supplies, C. S. Baxter – customs broker, and M. Tsingloy – fruits and vegetables. Alterations were made in 1946 by architects Birley Wade and Stockdill. At some point, the second storey cornice was removed and the storefront altered considerably. 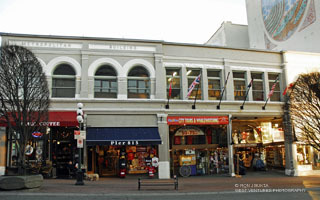 In 2009, the building is home to Mirage Coffee, Pier 815 – imports, and Spirit of Victoria – souvenirs.